Your complete guide for preparing for Rock. Below is a summary of the updates for this version. Added the Prepare Your Staff section to the Prepare Now chapter. Welcome to Rock! We hope that over time Rock becomes more than software to you. Our desire is that it becomes a foundation for your ministry. We want you to come to work actually looking forward to using Rock because it empowers you throughout your day. We've put in extra effort and countless late nights working to make Rock powerful yet simple to use. This document will walk you through preparing to transition to Rock at your organization and give you an overview of what to expect. Let's spend some time unpacking the full vision for Rock. While much of this will change, as future plans generally do, we want to give you at least a peek behind the curtain. We aim to take advantage of Rock's easy update capabilities by releasing new features often. You won't be waiting years for a pile of new features. We believe we should release early and often. No matter how good Rock is, we know that we can’t make it "all things to all people." That's why we built it on an extremely powerful framework from the beginning. A framework you can extend with an integration so tight, that if you follow best practices, you won’t be able to tell where our code stops and yours starts. We also see the value of a community that shares. So we've included a built-in shop where you can buy and sell plugins (including free plugins) which extend core Rock functionality in various ways, from single single-purpose reports to entire workflows, custom workflow actions, and website themes. You can visit the Rock Shop and install plugins from your own Rock installation by looking for it in the Admin Tools menu. And check out our Developer Documentation if you're interested in sharing your own work with the community. As new resources come online we'll make you aware of them through our newsletter, Slack channel, and social media posts. Our first principle is making sure that Rock is accessible to all churches who need it. Simply put, it needn't cost you anything. Sure, you will need to host the application yourself (more on that below) and possibly purchase hardware for check-in and contribution processing, but there is no cost for the software. How Is This All Getting Funded? To date a majority of support to create Rock has come from a few large churches that value the impact of technology on reaching people and have a heart to share their resources with others. These churches have helped partially fund the creation of a new 501c3 non-profit called the Spark Development Network to help support the Rock project by managing the intellectual property and providing community tools to support the project. To date, our developers are still spending much of their time working on custom side projects until full funding is established. While we have gotten this far, we have a much bigger vision for Rock for the future. We hope that it's used by literally thousands of churches and organizations worldwide. To achieve this goal, we will need others to step up and carry some of the weight. To partner with us to achieve this vision, we ask that you donate at least $1.50 per average attendee per year to Spark Development Network. (e.g. That's $1,500 for a church of 1,000 average weekend attendance.) Currently just under 50% of churches running on Rock have made the commitment to support the core development team, most at this requested donation level. These donations help fund the expansion of our efforts and pay for expenses. If your church is very small and this is not possible, we understand and hope that Rock is a blessing to you. As the Rock community continues to grow rapidly, your donations make all the difference in whether our team can keep up the same pace. Please visit our website for information on donating rockrms.com/Rock/Invest. As with any system move, there are likely to be expenses involved in the setup and migration. Here is a short list of the ones you should consider up front. These are not services provided by Spark Development Network and these implementation costs do not contribute to Rock's funding. Based on the size of your church, these costs will vary. Hosting Costs: Whether you choose to host on your own server, on the cloud, or through a third party hosting provider, there will be a cost to host Rock. More details about server specs and configurations can be found below. Migration Costs: As we mention below, we have many Full-Service Rock Partners who offer migration packages. Check-In Hardware: Rock supports many check-in kiosk devices and you may already have what you need on hand. However, you need to double-check your label printers and make sure they are one of the brands and models that work with Rock. Email Delivery Service: In order for your email to function correctly, you'll need a third-party delivery service like Mailgun. Training: There are lots of options, from free to paid, including training by Full-Service Rock Partners and Rock Master Classes. Whether you can commit financially or not you can give the gift of prayer. Rock is a serious undertaking that is honestly beyond the capabilities of everyone involved. We humbly ask you to pray for the project. Please consider adding us to your prayer list, but also please take a second to pray now. Unlike traditional software, there is no paid support for Rock. We do however have a well-considered plan to make sure you're successful. This plan includes three options. We believe documentation can be useful if it's not an afterthought. From the beginning of the project, we've been strategizing about how to make our documentation different; an easy-to-use resource. This won't be the single thick manual that sits on your desk collecting dust. We have a number of concise, well-designed manuals that each cover a single function. These manuals don't insult your intelligence by telling you every button to push. Instead, they will give you a picture of what must be done, then give you steps to make it happen. The manuals are also kept up-to-date, and when large-enough features are added, we'll add new manuals from time to time so you know how to use them. So whenever you update Rock, be sure to check back for the updated manuals! We also realize you aren't a cookie-cutter ministry; each church is different. We're working on providing ministry recipes that will give you patterns for implementing Rock in a way that matches your church. We hope that this document gives you an example of what you can expect in the future. We know that no matter how good the documentation is, there will still be a time when you need more assistance. With that in mind, we are creating tools for collaboration. As with any product, the people who know the most are the people who use it every day. The problem is that this knowledge is typically unavailable to the larger community. The tools we've developed allow individuals to post a question and have others respond. It's very similar to a website every developer uses daily called StackOverflow.com. This tool collects the tribal knowledge of the community, and at the same time makes it fun through gamification techniques like points and badges. Questions and answers posted here live forever, so they help more than just you. Finally, in Slack we've got a realtime chat option for you to connect with other churches using Rock. This is a great platform for questions that just need a quick answer, like where's the best place to look for information, or for help debugging a bit of code. Get invited to our free channel at rockrms.com/slack. But since the history is limited for free accounts, answers given here will be lost within about 2 weeks. So if it's a question/answer that could help more than just yourself, please consider posting in the Q&A instead for now. OK, But I Still Need Help! We hope that our documentation and community tools will help to make Rock a success at your church. For those with advanced questions, or who need extra assistance there is one other option. As we mentioned in our strategy section, we are building an ecosystem of services around Rock. These services currently include Rock hosting, website themes and paid support, and will continue to grow to include new services, as well. You can find a complete listing of our partners and their services on our Partners page. Rock was developed on Microsoft's ASP.Net platform and therefore requires a Windows Server environment to run. Below are specific requirements of the hosting platform. Note: You should double or triple these storage requirements if you are going to keep live backups on your hosted server. Watch out for PCI Compliance! While a single server configuration will do a lot quite well for small churches, you should be aware that it does not meet PCI requirements (which state you need to have your database and your web host in separate environments). So if you plan to take payments through your Rock site, or store financial information in Rock, you'll probably need to use the Medium Installs configuration instead (or use an external host). Rock offers you the freedom of where and how to host the application. Many of you might already know how you want to host, but for those still on the fence, here are some tips below. Many large ministries or organizations with strong technical resources may decide to install Rock on internal servers. This offers the best control, but at the cost of having to support and care for servers (think security patching, backups, upgrades, etc.). Keep in mind that Rock will not only be used by your internal staff, but also by your attendees. This requires that your servers be securely connected to the Internet. Our hosting partners have developed customized hosting and data migration services for Rock. They have a variety of packages for organizations of all sizes. Whether you want a playground or are ready to get started, you can be up and running within the day. You'll want to check out the Rock Solid External Hosting guide for more information. For those not interested in managing their own servers, traditional web hosting companies offer an affordable alternative. These services are usually focused on providing hosting for smaller websites with pricing as low as $5 per month. Be careful to select a firm that provides a service compatible with Rock. We have tested Rock on the following hosting providers. We do not have any relationship with, nor are we recommending, any specific web hosting companies. We have only tested and confirmed that Rock can be installed on the services above. It is up to each organization to choose its service wisely. Today's cloud services companies offer a great hybrid of the power and scalability of on-site hosting with a simplicity similar to traditional webhosting. These services allow you to start small and add capacity as you need it. Setting up these services can be a bit trickier than traditional vendors, but once configured, you don't need to worry about server patches and backups. While there are numerous cloud hosting providers (Amazon, RackSpace, AppHarbor to name a few), we would suggest that if you are interested in hosting Rock in the cloud, you consider Microsoft's Azure platform. It is by far the best technology fit for the Rock platform. Azure also allows you to start hosting at about $25 per month for a basic site and be able to scale up to a size larger than any church would ever need. For more information, see our Rock Solid Hosting Guides: Rock Solid Internal Hosting, Rock Solid External Hosting and Rock Solid Azure Hosting. With Rock, as with all things in life, you will get out of it what you put into it. We like to use the concept of a pyramid. Starting at the top, you will find significant value in Rock from the beginning. As you move down the pyramid, adding effort, time, knowledge and skills (Notice we didn't say money. Refreshing, isn't it? ), you will get exponential returns. For instance, any church, with the help of our documentation, should be able to get Rock installed and the basic features working. 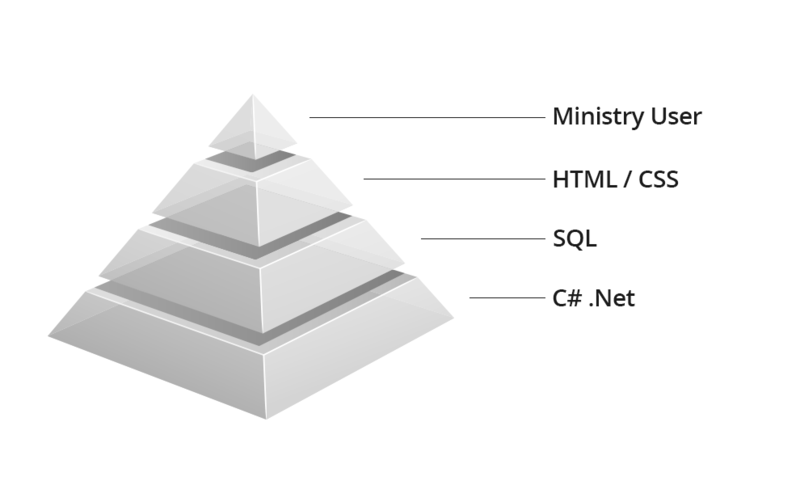 A ministry with knowledge of SQL, or better yet a programmer, will be able to do much more. Keep this pyramid concept in mind as you set your initial expectations for the project. Rock Administrator – Since you're reading this guide, that’s probably you. This is someone who is passionate about getting his or her church on a solid platform and has what it takes to get 'r done. Champion – Every Rock team should have at least one senior leader on it to make sure the team has the support it needs and to eliminate roadblocks. If you do not have this support, we recommend you get it before proceeding. Technical – Even if your church does not have a paid IT position, we recommend that you find someone in your church who has some experience with SQL and/or ASP.Net / C#. Web – If you do have a web designer, we highly recommend that you involve him or her early. The real power of Rock comes when you extend its capabilities outside of your office walls to your attendees. Having their early buy-in through the help of your web designer will make this much easier. Ministry Leaders – It's also highly advisable to have several ministry leaders on your team. Determine which areas you hope to implement first (e.g. groups, children's check-in, contributions, etc.) and be sure to invite them to your meetings. OK, you have your team, so now what? Before you even install Rock we recommend that you meet with your team to discuss what your goals are for a Church Management System. A successful project can be summarized with the following equation. The final ingredient to success is common to everything in life - Effort. The best technology and processes will get you nowhere if you don't get behind them and push. What do we want to track about a person? What types of groups do we want to manage? How do we see check-in working? What are our first priorities for a Church Management System? Where will we host Rock? Who needs to be a part of our team? Do we have the skills we need to be successful? OK, so you have your team assembled and your goals set. Now it’s time to get your staff on board. You know your staff and understand how to best approach the topic of moving systems with them. That said, here’s an analogy that we find helpful when introducing Rock to staff. Think of a CMS as a jet airliner. You’re about to change engines. Ministry, though, happens non-stop. You can’t land for two weeks and change out the engines. You’re going to change them mid-flight. That means things may get a little bumpy. Some people love change and embrace it. Change makes others uncomfortable. Moving to Rock means things are going to change. It’s inevitable. Like experiencing turbulence on a flight, it’s best to just embrace the bumps and go with the process as much as possible. As you go through the migration process, there will be a lot of communication and training. The day you actually flip the switch (we call it D-Day), there will be a lot of activity, and maybe some pain. A ball or two may be dropped, but you’ll get through it. After D-Day, there will be a mopping-up phase, where you have to clean up any leftover spills. Sometimes it's necessary to go backwards to move forward. That can be frustrating. Keep in mind that you’re moving to a better place. Throughout the process, communicate with your teams. Communication is key. If you do these things--keep moving through the turbulence, help with the clean-up and communicate with your teams—you’ll be on your way to a better future. Here’s a link to a video of a presentation we made on this topic if you want some more details. Provide “Ask Me About Rock” t-shirts to team leaders to signal their availability to answer questions or help out as needed. Make staff meetings fun by wearing launch t-shirts, goofy glasses and other festive accessories. Create live or pre-recorded training videos for staff. Provide an online space in Slack or other platform for staff to ask questions and share information. Reward attendance and engagement with a variety of prizes, such as Rock logo stickers, Chip stickers, Rock candy, Rock t-shirts, and other Rock-themed accessories. Give Rock-themed gifts for special occasions happening during and after the move. Look for additional training and connection opportunities such as a Master Class, Rock U, and the Rock Conference for your key staff. Official Rock shirts, hats, swag and other goodies are available in our promo shop, located at http://store.rockrms.com. Oh, and if you have a creative Rock launch idea you’d like to share, just send us an email with your success story at info@sparkdeventwork.org.